You know, I don't think I have ever experienced Rocky Road outside of a pint of ice cream. It is a great flavor, packed with little surprises and a great way to reminisce about childhood with just a taste. I distinctly remember savoring the chocolate ice cream, packed with little marshmallows and crunchy peanuts. But it seems there are many variations on the idea of "Rocky Road" and variations as well as original are often the topic of debate. Go ahead and google it. Everyone seems to have an opinion. But this week I am sharing a fun variation on rocky road with a Rum Rocky Road Bundt Cake. All the things I love about my childhood favorite, without the fear of it melting. 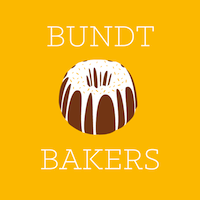 Yes, it is time for this month's Bundt Challange and Laura from Baking In Pajamas threw down the guantlet for a little Rocky Road Challenge for May in #BundtBakers. Big thank you to Laura for hosting this month! Well, I couldn't do a plain rocky road cake.. I wanted something slightly different. Something to take my childhood ice cream dreams into my grown up life. So there was rum. Or, I should rather say rum flavoring. It is just sad to pull every bottle out of the cupboard to only realize that there is no Bourbon and no Rum. ....I just wasn't feeling the Pineapple Rum for this recipe. I hope you understand. The Rum flavor actually goes nicely with the sweetness of the chocolate. It just gives it a little added dimension. The truth is Rocky Road can definitely contain fruit, usually dried, and cookies are common too. What I really wanted was that classic ice cream flavor of peanuts and marshmallows in a creamy chocolate ganache over a moist chocolate cake. This ended up being the perfect "cake cake" to serve with a large glass of milk and enjoy with my youngest. He was the happiest little toddler ever to get the first slice of chocolate "cake cake" with Mama while his siblings were off at school. Preheat the oven to 350 degrees. Butter your bundt pan and then coat lightly with dark cocoa powder. Knock out any excess and set aside. In a saucepan over medium heat, combine the butter, cocoa, salt and water. Let the butter melt and whisk the ingredients to combine. Remove from the heat and let cool slightly. Whisk together the flour, sugar and baking soda in a large bowl. Slowly stir in the wet mixture till combined (don't worry, it will be thick). Whisk in the eggs, one at a time, then add in the Greek yogurt and rum extract. Whisk until smooth. Pour the batter in the prepared bundt pan and bake for 40 to 45 minutes. To test if it is done, check by inserting a toothpick. It should come out clean. Let the cake cool for about 20 minutes, then invert onto a cake plate. While the cake is cooling you can make the frosting. In a small saucepan, melt the butter and then whisk in the cocoa and milk till smooth. Add in the vanilla extract and then powdered sugar till the frosting is thick, but still pour-able. Stir in the peanuts and spoon over the inverted bundt cake. Dot the top of your cake with marshmallows before the frosting sets up.